MARINA DEL REY — In 2011, some boaters, local residents and visitors here were treated to an anticlimactic Independence Day celebration, as they mistakenly showed up for an annual waterfront fireworks display that had been cancelled due to budget cuts. But thanks to a variety of community sponsors, the sky will once again burst with color this year, as enough money has been raised to bring back Marina del Rey’s popular annual Fourth of July fireworks show. While waterfront fireworks shows in San Diego County have been facing threats of environmental lawsuits and higher costs due to newly required water quality permits, last year’s decision to nix the show in Marina del Rey was solely monetary. At the time, Department of Beaches and Harbors marketing analyst Debbie Talbott said it was not fiscally responsible to spend thousands of dollars on a fireworks show while community programs and services were being cut. However, so far this year, more than $24,000 has been raised for the upcoming Independence Day event. Those funds will cover the expenses of the pyrotechnics, and Baker expects the city of Los Angeles to waive traffic control and street closure costs. “It’s important to get the word out that last year’s cancellation was a one-time occurrence — and we need to make sure we raise enough money each year to keep this event happening,” Baker said. This year’s show will feature a 20-minute fireworks display launched from a barge in the main channel, just off the south jetty and past the UCLA Aquatics Center. Boaters in the harbor will get some of the best viewing locations for the show, and good landside viewing spots include Fisherman’s Village and Burton Chace Park. 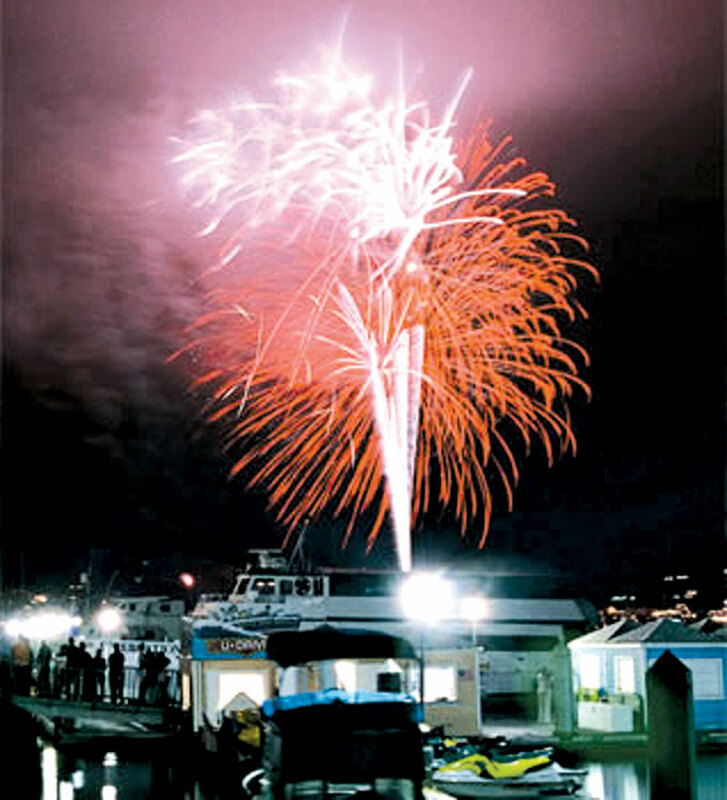 Boaters can go anywhere in the marina — including the main channel and Basins A-H — to view the fireworks show. Boaters wishing to get close to the barge for vessel viewing should be aware of the “fallout zone” around the fireworks area, established as a 420-foot area around the barge. Anchoring is not allowed in Marina del Rey during the fireworks show. Baker noted that viewing the show from the open ocean is a good alternative to having to maneuver and avoid other boats inside the harbor — and fireworks shows up and down the coast can be viewed from outside the harbor’s breakwall. The Marina del Rey WaterBus will be in operation from 11 a.m. to midnight July 4, providing a waterside shuttle to seven locations throughout the harbor. The fireworks show is planned to start at 9 p.m. July 4, and it will run for 20 minutes. For more information and updates on the show, visit beaches.lacounty.gov.